As a teenager circa 1995, I wanted to make my own guitar effects but struggled with the basics of electrical engineering. As a grad student in 2001, I tried again and built a Fuzz Face clone, but didn't have time to keep going. In 2014, I decided to try again and now I'm having a blast with it. In 2012, I challenged myself to play a game every day of the year. I mostly succeeded. I am also a big fan of wordplay, especially anagrams. And I'm sort of getting into blogging and tweeting. You can find us on Spotify, Apple Music, Google Play, Amazon Music, SoundCloud, and Bandcamp! From 2009-2012, fellow machine learning researcher Jacob Eisenstein played bass with us (that's him wearing a striped shirt in the first video). The first record Pretty Please also features ML/NLP heavy-hitters Chris Dyer on cello and Nathan Schneider on violin. In grad school at UW-Madison, I fronted a few bands, and released a solo record called Sketches in 2004. You can hear that record and assorted other tracks on SoundCloud. However, I have found being part of a band more enjoyable than playing solo or fronting a band myself. I also founded FAWM.ORG, an online community for musicians of all stripes, and annual songwriting challenge (to write 14 new songs each February). This is gradually becoming more of a research project for computational creativity tools and social network modeling. 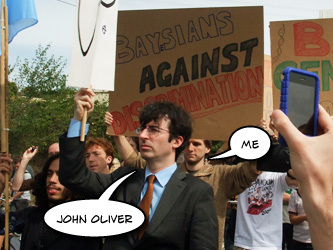 For this, my left arm appears briefly on the October 1, 2009 episode (holding the "Bayesians Against Discrimination" sign at about 0:25). Fall 2012: I gave a guest lecture on active learning in CMU's graduate Machine Learning course. Spring 2011: I gave guest lectures in two CMU courses: Machine Learning and Social Media Analysis. Fall 2009: I gave a few lectures in the CMU graduate seminar Advanced Statistical Language Processing: Reading the Web. Summer 2008: I taught the Computational Biology & Biostatistics course for UW-Madison's IBS Summer Research Program. Summer 2003: I taught UW's CS 540: Artificial Intelligence. Spring 2001: I taught a UW undergraduate course in Computer Graphics & Web Design. 2000-2002: I was a UW teaching assistant for several courses including Compilers, Computer Architecture, and Java Programming. Because these things apparently matter. Paul Erdős ⇒ Ronald J. Gould: S. Burr, P. Erdős, R.J. Faudree, C.C. Rousseau, R.H Schelp, R.J. Gould, and M.S. Jacobson. Goodness of trees for generalized books. Graphs and Combinatorics 3(1): 1-6. 1987. ⇒ Avrim Blum: A.L. Blum and R.J. Gould. Generalized degree sums and Hamiltonian graphs. ARS Combinatoria 35(A):35-54. 1993. ⇒ Tom Mitchell: A.L. Blum and T.M. Mitchell. Combining labeled and unlabeled data with co-training. Proceedings of the Conference on Computational Learning Theory (COLT), pages 92-100. ACM Press, 1998. ⇒ myself: A. Carlson, J. Betteridge, B. Kisiel, B. Settles, E.R. Hruschka Jr. and T.M. Mitchell. Toward an Architecture for Never-Ending Language Learning. In Proceedings of the Conference on Artificial Intelligence (AAAI), pages 1306-1313. AAAI Press, 2010. This is particularly cool for me since I am "Burr S." and the lead author of paper #1 in the chain is "S. Burr." What's more, link #3 is an important paper in the literature for semi-supervised learning, a research area in which I've been somewhat active. I like that my name is embedded in Mr. Bur-meister's. Admittedly, Locust Grove is an obscure docu-drama about George Rogers Clark that isn't even listed in IMDb. Furthermore, Burmeister went by a pseudonym (it was a non-union job: he played a peddler, I played GRC's nephew), but I still think it counts. I stopped pursuing a childhood acting career after that. Interestingly, I do have an IMDb page, but for a silly film I scored. So in short, I have a Erdős-Bacon Number of 4 + 3 = 7. Not as impressive as Natalie Portman (6), but closer than Fred Alan Wolf (8), and tied with the likes of Stephen Hawking and Carl Sagan. One of my life goals is to have a more properly-defined Erdős-Bacon Number of 6 or less. Various webapps from over the years that use simple statistical NLP in fun ways. From American computer scientists to German theologians via Danish linguists! Burr Settles, PhD Computer Sciences (2008), University of Wisconsin-Madison. Mark Craven, PhD Computer Sciences (1996), University of Wisconsin-Madison. Jude Shavlik, PhD Computer Science (1988), University of Illinois at Urbana-Champaign. Gerald DeJong, PhD Computer Science (1979), Yale University. Roger Schank, PhD Linguistics (1969), University of Texas-Austin. Jacob Mey, PhD Linguistics (1960), University of Copenhagen. Louis Hjelmslev, MA Linguistics (1923), University of Copenhagen. Holger Pedersen, PhD Linguistics (1897), University of Copenhagen. Heinrich Friedrich Zimmer, PhD Indology and Sanskrit (1878), University of Tübingen. Rudolf von Roth, PhD Semitic Linguistics (1843), University of Tübingen. and Georg Heinrich August Ewald, PhD Oriental Languages (1823), University of Göttingen. Ernst Gottlieb Bengel, Theology, University of Tübingen. Gottlob Christian Storr, Theology (1768), University of Tübingen. Credit goes to Ray Mooney and Tim Wille for connecting the dots. © 2019. All rights reserved ⇔ Lehrer's vilest drag.